It is simply a matter of time before a major earthquake hits Southern California, according to a new study by the US Geological Survey (USGS), which examined patterns of historic quakes. The only question is how long it will be before the ‘Big One’ strikes. The study – the most extensive of its kind – examined a section of the San Andreas fault that runs along Interstate 5, near Frazier Mountain in northeast Kern County. “One of the reasons why this location is of importance is because in Southern California, the Big Bend, Carrizo, and Mojave sections of the San Andreas Fault accommodate 50-70% of plate motion. This means that the seismic hazard is high,” according to Temblor. To understand the size and likelihood of future earthquakes striking the area, the researchers looked into the past, by digging more than 30 trenches to trace ancient temblors. “To get 1,200 years of records, we have to do lots of excavations and go quite deep,” said the study’s lead author, USGS research geologist Kate Scharer, as quoted by the Los Angeles Times. Scharer and her team found 10 major earthquakes over a 1,000-year period. They were able to date the temblors by examining charcoal and plant remains found at each horizon. The most common magnitude found at the site was 7.5. A 7.9 earthquake in 1857 – the last major temblor to strike – was so powerful that it caused the soil to liquefy and trees to sink and uproot. The shaking lasted between one and three minutes. Since then, land on either side of the fault has been pushing against the other at a rate of more than 1in per year, accumulating energy which will be suddenly released in a major earthquake that would move land along the fault line by many feet. A repeat of the 1857 quake could move the land as much as 20ft, damage aqueducts that ferry water into Southern California from the north, disrupt transmission lines, and damage Interstate 5. For instance, while there was once a gap of just 20 years between two temblors, another pair saw a gap of 200 years between them. The average interval between quakes was found to be approximately 100 years, meaning the gap separating today from the 1857 earthquake is already 60 years more than the average. “Longer gaps have happened in the past, but we know they always do culminate in a large earthquake. There’s no getting out of this,” Scharer said. 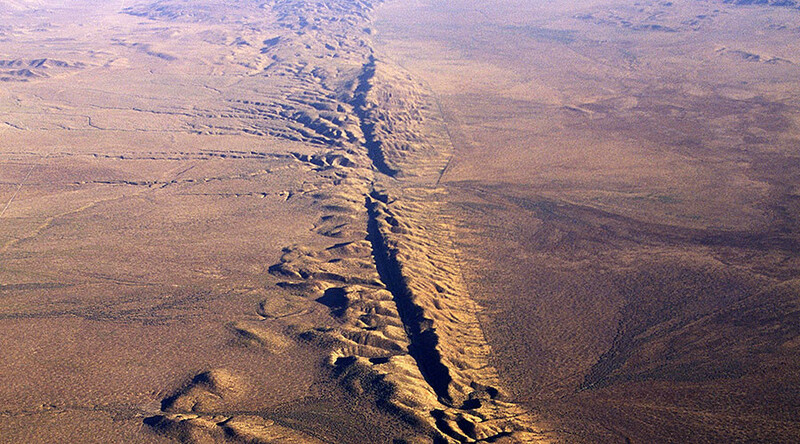 The San Andreas Fault extends roughly 1,300km (800 miles) through California. It has three segments, each with a varying degree of earthquake risk. The most significant is the southern segment, which passes within about 56km (35 miles) of Los Angeles.